A Canadian researcher attained valuable insight into the lives of feral cats using a special collar, and is now working with communities to find the best way of coping with the many cats that are maxing out animal shelters. University of Guelph wildlife biologist Tyler Flockhart teamed up with Ontario communities to put a collar with a tracking device on 32 cats. He then studied where these sterilized strays went and how they acted in their communities until his experiment ended last month. "A common intervention is to sterilize outdoor cats, but we don’t know how that sterilization influences their behaviour," Flockhart said on CTV's Canada AM. The wildlife biologist tracked the 16 sterilized and 16 nonsterilized feral cats within Toronto and Guelph, Ont. communities. Flockhart found that sterilizing cats didn’t seem to change their behaviour, and over the 10-month experiment the cats stayed within about a one-block radius. This suggested to him that cats survived well within these communities, and that they could potentially be hurting the bird and mammal population. Cats are the number one killer of birds in Canada, according to Environment Canada, killing about 200 million in 2013. Flockhart believes reducing the number of strays in communities across Canada would also reduce the number of birds and animals killed each year. But over the past few years the number of cats filling up shelters continues to rise, with their numbers reaching more than 100,000 in 2013 , according to the Canadian Federation of Humane Societies. About 33 per cent of these cats were euthanized, the organization said. Flockhart said many Canadians react to seeing strays in their community by bringing them to animal shelters. But many feral cats are euthanized because they cannot be adopted due to their wild nature. This same cat crisis is playing out on the streets of almost every Canadian community, Flockhart said. Euthanasia has been a common method of reducing cat populations, Flockhart said. But as it has been scrutinized by the public in more recent years, many Canadian shelters have begun spaying or neutering these cats to prevent them from reproducing. Instead of taking them to shelters, Flockhart recommends Canadians should see feral cats as wild animals and leave them alone. He said to only call the animal shelter if the cat is sick or injured. There isn't a magical solution to bring down stray and feral cat numbers, Flockhart said, but community-focused intervention could help solve the problem. Flockhart believes each community can tailor a solution to their cat problem. This could include euthanizing cats, educating cat owners and introducing taming programs for feral cats. "There is no simple solution, it's not black and white," he said. "You need to consider both animal welfare and potential impacts on the environment." 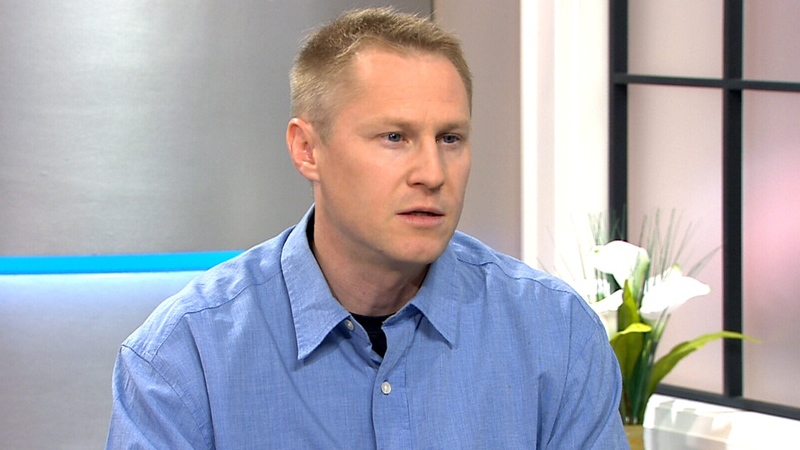 Tyler Flockhart speaking on Canada AM about his cat collar that tracks the movement and behaviour of Canadian stray and feral cats on July 27, 2015.